This is the set that will provide all of what’s exciting about model car racing with lap times, lap timing, pit stops and race organization viewed on you tablet with the included app. The Scalextric C1329T ARC One (App Race Control) System set utilizes an app with wireless Bluetooth so your tablet or smartphone will control and display lap counting and timing, race results, a listing of your racing stable, track planning and dozens of other race and car control options. 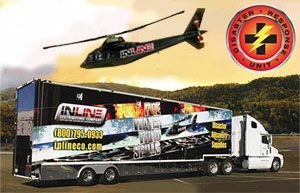 The set includes two cars and over 16-feet of track to assemble into either of two figure 8s or an open road course. If you prefer to just race, without using the app, just plug in the power pack and controllers, drop the two cars in their slots and go! When you want the lap counting, lap timing and other race management control options, simply download the app. 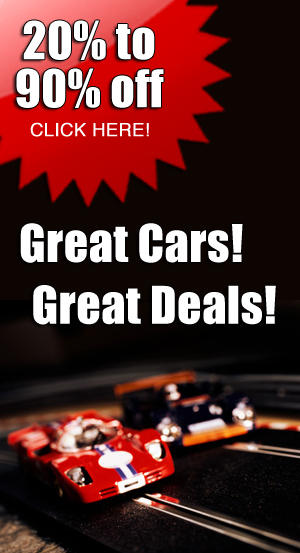 Note that some brands of cars, particularly older or vintage models, and certain modifications may cause interference and malfunctions to the app. The Scalextric ARC One (App Race Control) system utilizes an app so your tablet or smartphone will control and display lap counting and timing, race results, a listing of your racing stable, track planning and dozens of other race and car control options. 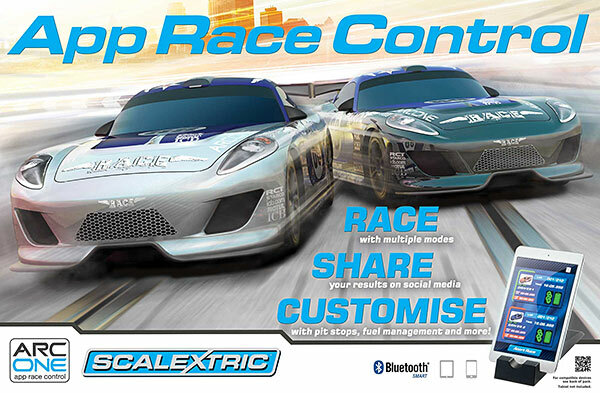 Scalextric ARC ONE is a revolutionary slot car system that allows users to wirelessly create and manage races with a handheld smart device*, such as a smartphone or tablet. Download the ARC app, then connect your device via Bluetooth to the new ARC powerbase, unlocking unique features and control of your races. The two controllers and Power Supply (included) are connected to the Power Base track with the standard Scalextric cables. 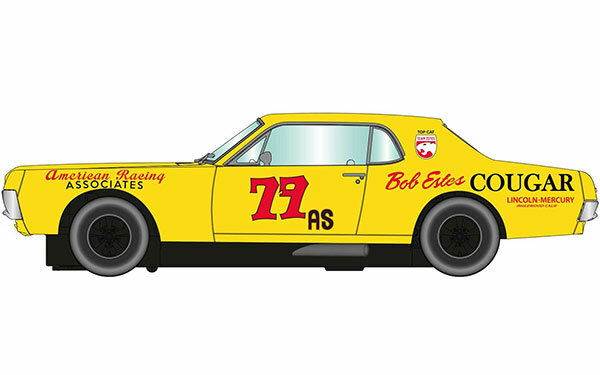 Personalize your races by selecting features such as race type, driver names and number of laps. Customize and save your race settings and car setup, before you head out on the track to test your skills and challenge your opponent. Use the interactive ARC app to create your own Scalextric garage, listing your slot car collection, track pieces and accessories. See your available layout options, post your race stats on Facebook or Twitter – the possibilities are endless! * NOTE: Tablet/smartphone not included—see the compatibility image chart on this product to determine which smart devices are compatible with this product. 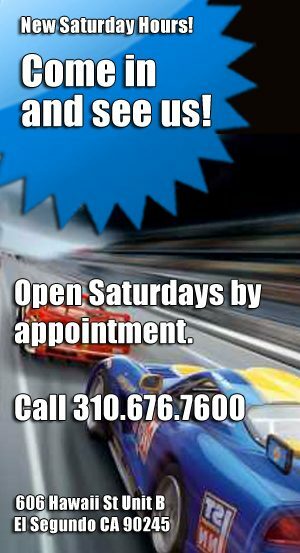 ONLY AT ELECTRIC DREAMS! 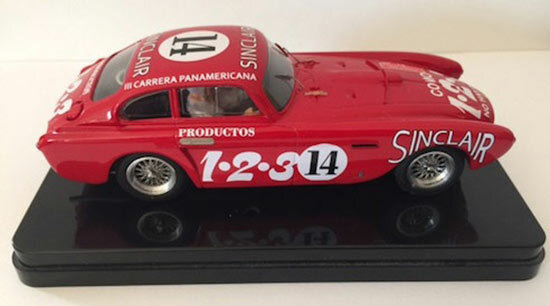 Special “collector” package of two Slot.it 1971 Alfa Romeo 33/3 “winners” (first and second places) from the 1971 Targa Florio in a special Slot.it two car four-color box commemorating the victory. 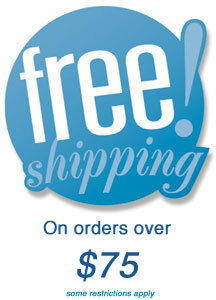 Regular price for the two cars plus box is $171.97. Sale price special $149.99. Each of the cars is supplied in its own box. No dealers. 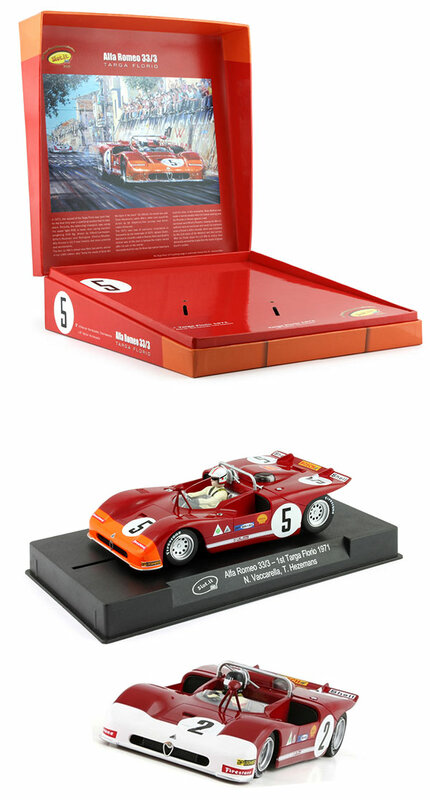 Slot.it SICW15X two-car Alfa Romeo 33/3 1971 Targa Florio “Winners” collection with special commemorative box. 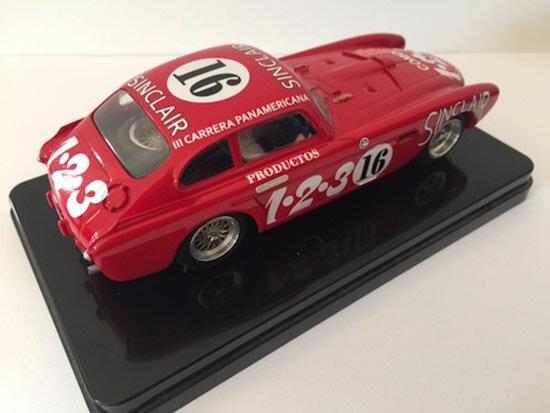 Special “collector” package of two Slot.it 1971 Alfa Romeo 33/3 “winners” (first and second places) from the 1971 Targa Florio in a special Slot.it two car four-color box commemorating the victory. Each of the cars is supplied in its own box. The Slot.it box was never sold until now, ready to accept the two Alfas. No dealers. 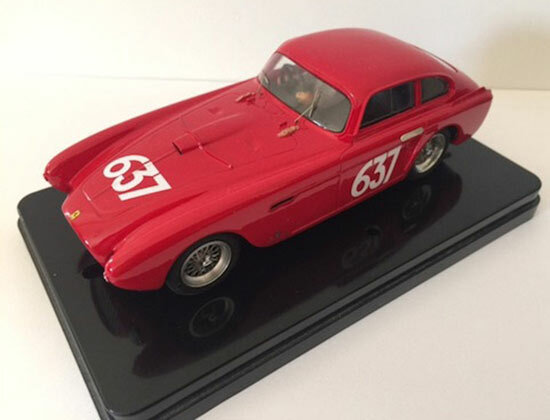 The Targa Florio Winner 1971 is the second release of the “Targa Florio Winners” collectable boxed sets. The Slot It SIKW01 Ferrari 312PB kit two-car set (both cars are easy-assemble kits) was the first “Targa Florio Winners” set.This beautiful new SICA15X collector’s item consists of the two cars and the box celebrating glorious Alfa 33’s 1-2 victory in the 1971 edition of the classic Sicilian race. 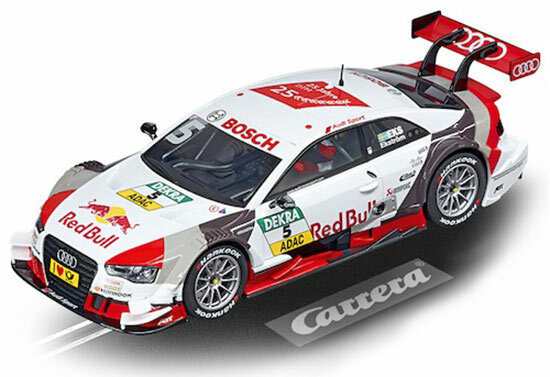 The Limited Edition Carrera 1/32 and 1/24 scale cars are here now but they sell out quickly. 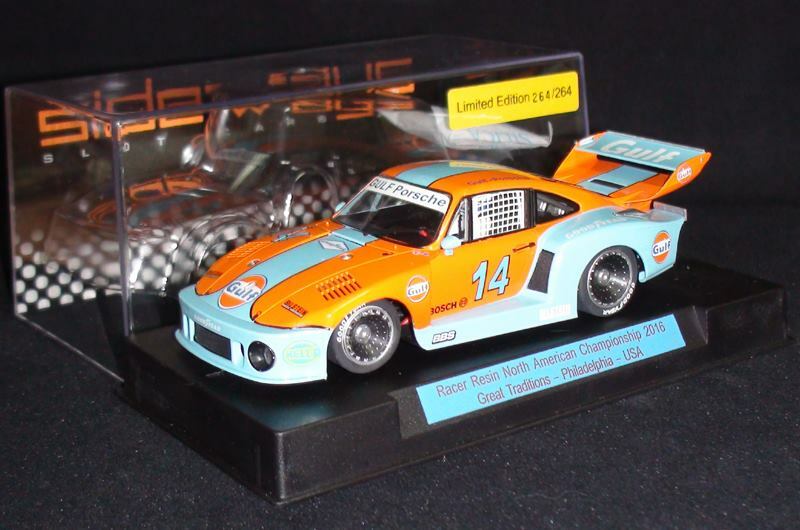 There are only a few of these Sideways Group 5 Porsches available so order yours while our stock lasts. The MMK Ferrari 375MM that Cunningham raced at LeMans in 1954 is one of the team’s most famous cars. We were able to get a few of the hand-crafted models with a cast-resin body and etched details so order yours now— there will be no more. Six fabulous Ferraris, including the car that Carroll Shelby and Jack McAfee drove in America, and all three of the 1952 Carrera Panamerica road race coupes are here now. All are hand-made, with cast-resin bodies and separate etched-metal details. All six are available ready-to-race. MMK73E rtr Ferrari 340 Mexico Vignale Berlinetta no. 12 Offutt AFB, Omaha, NE, 1953 2nd Carroll Shelby and Jack McAfeeThe car that Shelby and McAfee drove at the SAC airport races in 1953. 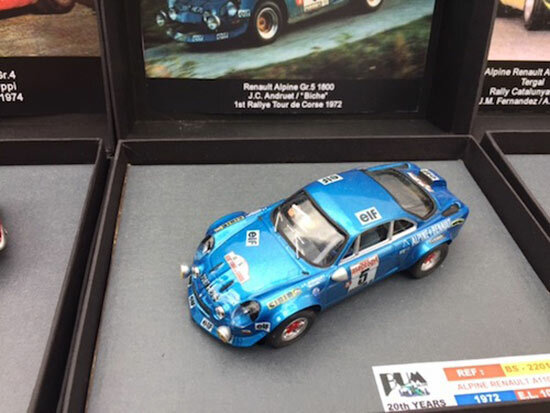 The incredible Renault Alpine is a new ready-to-race model from MMK with a hand-made, painted and detailed cast resin body. There are only be a few available so order yours now. The March/April 2017 number 92 issue of Model Car Racing will be here February 1 and you can pre-order it today. Yes, that is the forthcoming Policar 1970 March 701 on the cover. MCR92 Model Car Racing Magazine, March/April 2017 (C)—PRE-ORDER NOW! 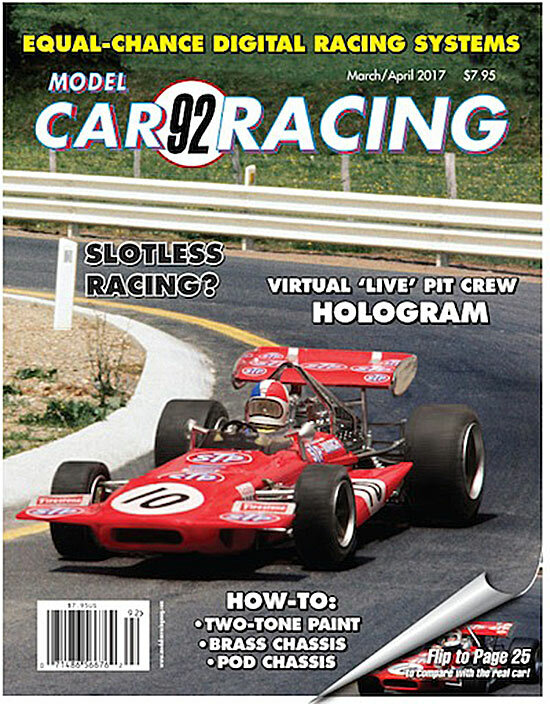 The latest developments in slot car racing, including slotless racing, a live-action hologram pit crew and races for digital cars, are featured in this issue as well as do-it-yourself techniques for two-tone painting, applying chrome and decals and both modern “pod” chassis and seventies-proven brass chassis. 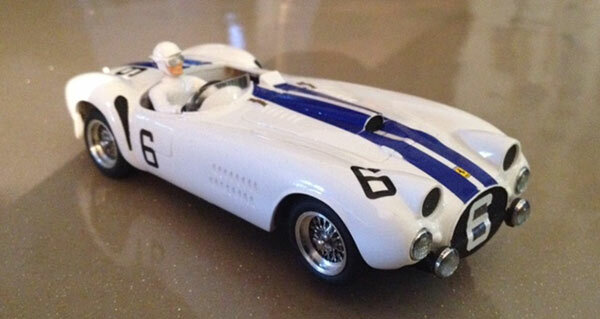 There are full reports on the prototypes’ racing background and the performance of the 1/32 scale models of the 1958 Aston Martin DBR1, 1963 Corvette Stingray, 1965 Ferrari 365 P2, 1967 Corvette C2, 1970 March 701 Formula 1 car and the 2015 Porsche 911 Type 997 and touring car racing with the 1972 Ford (Australia) XY GT-HO Falcon, 1990 BMW M3 E30 BTCC, 2014 Honda Civic BTCC, 2015 BMW 125 Series 1 BTCC and 2015 BMW Mini Cooper F56. There are plans so you can assemble a 2-Lane version of the 2-Lane ROC track inside Marlin’s baseball stadium in Miami for 8 x 8-feet and 4 x 8-feet with plastic track. There is also a plan for an HO scale AFX 4-Lane version of the ROC stadium track on a 4 x 8-foot tabletop. 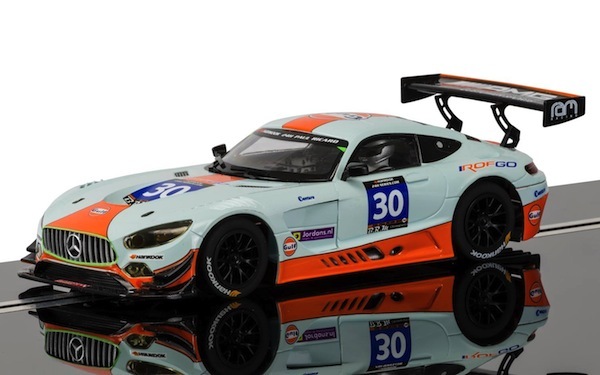 All of the cars and sets that Scalextric has promised for 2017 are on the website. These are just a few of the more exciting cars coming from Scalextric in 2017, with the dates they are supposed to ship them. Most will be in limited supply so pre-order yours now. 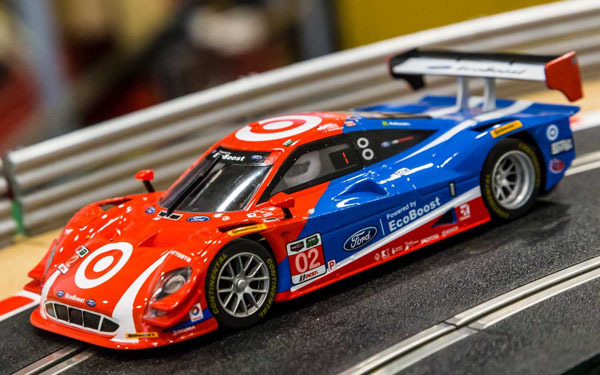 The Daytona 24hr is the first and longest races of the TUDOR United Sports Car Championship season. It sees over 50 cars from four separate classes battle for 24 hours, all for the coveted Rolex Daytona watch. The 53rd edition of the historic race was also the first race for the 2015 United Sports Car Championship season. Victory on the day went to the Number 2 Team Chip Ganassi Racing car with Scott Dixon, Tony Janaan, Jamie McMurray and Kyle Larson behind the wheel. Together they completed 740 laps, which totals an astonishing 2,634 miles! Famously called “the most beautiful car ever made” by Enzo Ferrari, the Jaguar E-Type was originally unveiled at the 1961 Geneva Motor Show as a high performance and competitively priced sports car. The legend goes that the E-Type selected to be unveiled at the 1961 Geneva Motor Show was driven from the Browns Lane plant in Coventry, by Jaguar executive Bob Berry to Geneva arriving just 20 minutes before the global reveal with only a few minutes for a quick wipe down. 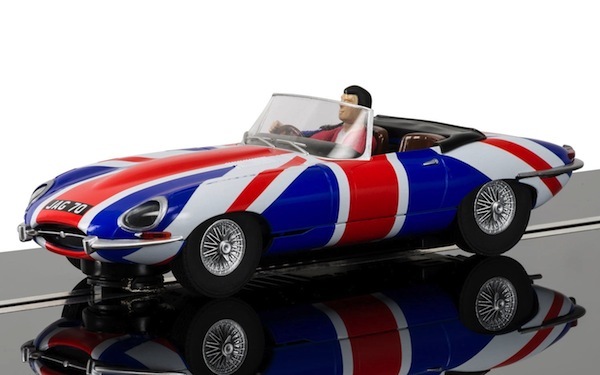 More than 50 years after its launch the Jaguar E-Type is widely considered a design icon and notable landmark in automotive history, and one that you too can recreate in its swinging 60’s inspired paintwork. No man is ever likely to emulate John Surtees’ feat of winning World Championships on two wheels and four. A racer who would be equally at home in the Halls of Fame of both motorcycle and car racing, ‘Big John’ rarely won the accolades his success deserved. Surtees’ prowess on motorcycles won him universal respect, and soon after trying out cars for Vanwall and Aston Martin in 1959, he switched full-time to cars in 1960. 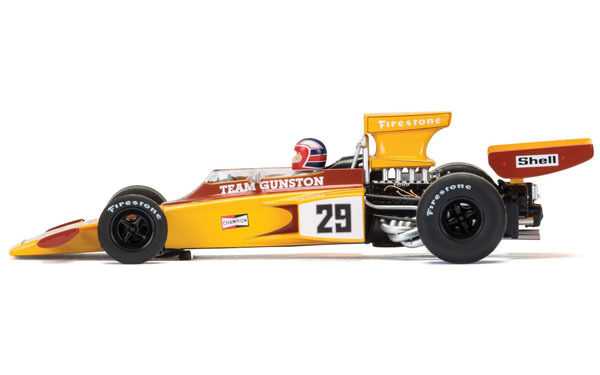 Having driven for Lotus, Ferrari, Honda and BRM, Surtees then set up Team Surtees in 1970. The season didn?t start to well with the first 3 races all ending in retirement, but in round 5 at the Dutch GP held at Zandvoort Surtees got his first point of the season. Surtees had to work hard for the victory after Qualifying 14th, but after some hard work and some luck through others retiring Surtees held on to the final points position. The wild Lancia Stratos is striking in this unique all-black scheme. The cars are on the way from Sideways with their usual super-quick Group 5 chassis so you can pre-order yours now. 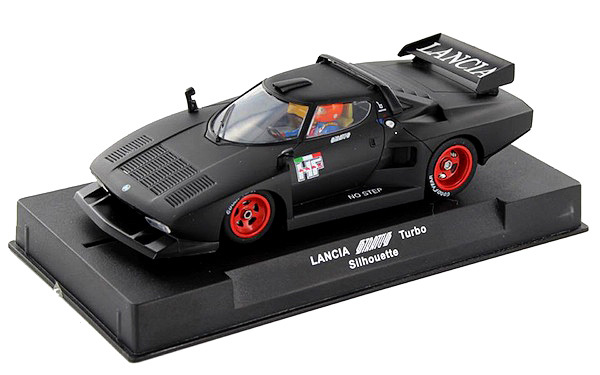 Racer Sideways SW52 Lancia Stratos limited edition—PRE-ORDER NOW! Two new NSR cars are due to arrive next week so pre-order yours now. 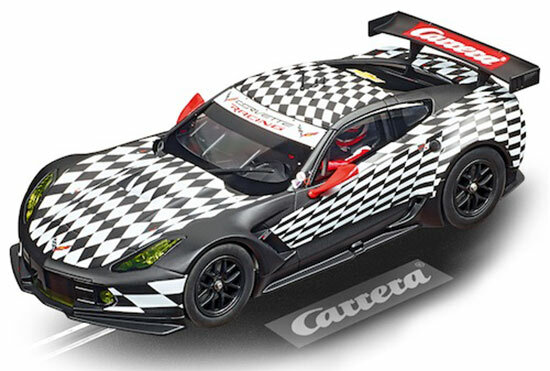 NSR NSR0022AW Chevrolet Corvette C7R RED Test Car—PRE-ORDER NOW! 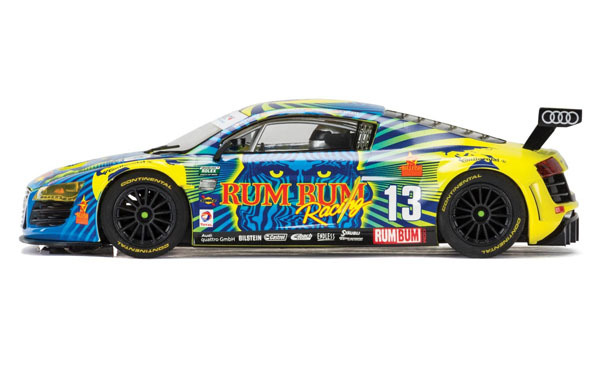 NSR 1/32 Analog RTR Chevrolet Corvette C7R LMS RED Test Car – Adjustable front axle ride height – Drop Arm type Guide Flag with Screw to Allow Fixed Position – Setscrew Aluminum wheels all around – Anglewinder Balanced King Motor 21,400 RPM & 350 g-cm Torque – Adjustable suspension motor pod – Heat treated axles – Machined bronze self lubricating bushings – Ultra smooth and quiet all metal gearing – Adjustable suspension motor pod – Clear Coat Finish for maximum durability and high gloss – Includes the EVO 2 Chassis that will accept Inline / Anglewinder and Sidewinder Triangular motor pods. NSR NSR0031AW Mosler MT900R #101 Spirit Kia—PRE-ORDER NOW!